Other: With Obi. 13 4:11 Bold As Love. Our condition grading is based on Goldmine Record Collectors guidebook. If you'd like to know accurate condition of individual item. We are sorry for our tone is so harsh. 2 Midnight Lightning. 7 Once I Had A Woman. IMPORTANT: you may choose free item only from CD catalogue, not from DVD, Blu-Ray or Mini LP. 6 Machine Gun. You will get free souvenir gift as well. We are promise to you – we will resolve your problem! Bank (Only in Spain). IMPORTANT NOTE (Only inserts, WITHOUT jewel case). (Only INLAYS & CD, WITHOUT jewel case). Bank (Only in Spain). IMPORTANT NOTE. EIRE APPARENT – Sun Rise. Flawed Gems GEM 36. Swedish release.FACTORY SEALED NEW CD. Originally issued in 1969. This edition issued in 2010. Includes the complete. Graham also spent spells with Clancy and Help Yourself. THE JIMI HENDRIX EXPERIENCE-ARE YOU EXPERIENCED?. -CD-MADE IN USA BY REPRISE RECORDS 6261-2 MATRIX: 1 6261 RE-1 SRC-02. BOOKLET: MINT. WE APOLOGIZE FOR THE INCONVENIENCE. =====================================================================================. (Only inlays & CD, WITHOUT jewel case). IMPORTANT NOTE. (Only INLAYS & CD, WITHOUT jewel case). IMPORTANT NOTE Bank (Only in Spain). 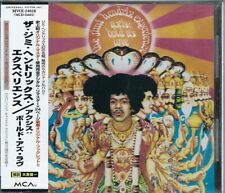 JIMI HENDRIX Axis Bold As Love JAPAN 1st Press CD 1986 P33P-25023 3300yen RARE! JIMI HENDRIX / Axis Bold As Love. Bold as Love. JAPAN CD, 1st Press,1986, P33P-25023. Made in Japan. It's so hard to find even in Japan! Little Miss Love. Cover:Very Good . USA,Canada. Bank (Only in Spain). (Only inlays & CD, WITHOUT jewel case). IMPORTANT NOTE. Other: With Obi. 3 The Wind Cries Mary. 5 All Along The Watchtower. 13 Castles Made Of Sand. We are sorry for our tone is so harsh. Our condition grading is based on Goldmine Record Collectors guidebook. 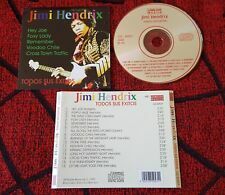 JIMI HENDRIX Concerts JAPAN Early Press CD 1989 P20P-22014 RARE! Label: POLYDOR Cat NO.P20P 22014. JIMI HENDRIX / Concerts. JAPAN CD, 2nd Press in 1989, Out Of Print. Made in Japan. It's so hard to find even in Japan! Cover:Excellent . USA,Canada. (Only inserts, WITHOUT jewel case). CATALOGUE NUMBER. IMPORTANT NOTE. 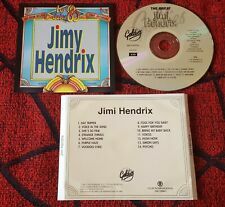 Buddy Miles All The Faces of Buddy Miles 2005 Sony/Japan Mini LP CD Jimi Hendrix. Condition is Brand New. Shipped with USPS Media Mail. Other: With Obi. 17 4:14 Are You Experienced?. We are sorry for our tone is so harsh. Our condition grading is based on Goldmine Record Collectors guidebook. If you'd like to know accurate condition of individual item. Other: With Obi. Our condition grading is based on Goldmine Record Collectors guidebook. If you'd like to know accurate condition of individual item. Paperwork: Excellent. We are sorry for our tone is so harsh. Night Bird Flying. Hier folgende CD / Here following CD Classic Rock & Pop. In From The Storm. Rock englischsprachig. Belly Button Window. Straight Ahead. Title: Gateways. Format: Digipak CD. JIMI HENDRIX Cornerstones 1967-1970. 1 The Jimi Hendrix Experience Hey Joe 3:31. 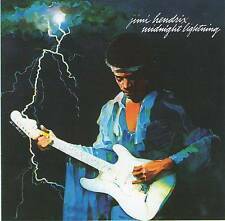 8 Jimi Hendrix Have You Ever Been (To Electric Ladyland) 2:10. 9 Jimi Hendrix Star Spangled Banner 4:10. 10 Jimi Hendrix Stepping Stone 4:09. Hey Baby (New Rising Sun). Hier folgende CD / Here following CD Classic Rock & Pop. Rock englischsprachig. Erscheinungsdatum / Release date: 17.10.2014. Hear My Train A Comin'. Look Over Yonder. Star Spangled Banner. JIMI HENDRIX. CD MADE IN BRAZIL 1990. ORIGINAL 1st BRAZILIAN PRESSING1990. ASK EVERYTHING YOU NEED TO KNOW AND I WILL ANSWER AS SOON AS POSSIBLE! JIMI HENDRIX. FIRST PRESS MADE IN BRAZIL 1996. SOUL FOOD (THAT'S WHAT I LIKE). CRY ALONE!! CD MADE IN BRAZIL 1996. " THE EARLY YEARS ". I ONLY HAVE THIS COPY, NEVER SEEN ANOTHER ONE, BUY NOW OR. 2008 Japan SHM CD. Picture Label SHM CD Disc : Super High Material CD - Playable on All CD Players. Jimi Hendrix Are You Experienced. Are You Experienced?. Cover Booklet. Jewel Case. Third Stone From The Sun. Jimi Hendrix. The Largest Collection in Germany. Second Hand and New. Two CD set. JIMI HENDRIX. FREEDOM: ATLANTA POP FESTIVAL. 1 Fire Jimi. GENRE: ROCK. FORMAT : COMPACT DISC. RECORD LABEL : SONY LEGACY. Your DVD instructions manual should include the Region information for your DVD player. Rock Pra Cabeça DVD. ♫♫♫♪♫♫♫♪♫♫♫♩♫♫♫♩. Peter Gunn. Bonne Tribute To Robert Johnson. Night Of The Guitars. StillGot The Blues (For You). JIMI HENDRIX. " CORNERSTONES 1967-1970 ". RARE CD - BRAZIL ONLY COVER AND BACKCOVER. Wind Cries Mary, The. MADE IN BRAZIL 1990. CD MADE IN BRAZIL 1990. MINHA HISTÓRIA - LIMITED EDITION. Stepping Stone. PRINCESS All For Love JAPAN 1st Press CD 1987 P33P-20142 RARE! JAPAN CD, 1st Press in 1987, P33P-20421. PRINCESS / All For Love. Made in Japan. It's so hard to find even in Japan! 2 Everybody Says It's Love. 8 All For Love. 9 Jammin' With Your Love. 10 I Wish You Love. Jimi Hendrix Experience - "Axis: Bold As Love"
Up for sale is a German pressing of the Jimi Hendrix Experience CD, "Axis: Bold As Love". They also give a truncated "Wild Thing" just as the guitar is going way out of tune. The band is Mitch Mitchell on drums, Noel Redding on bass, and the original Jimi Hendrix Experience and they can be heard far better on the bootleg -- that even more underground versions display far more clarity than the Ember Records, Ltd. releases. First Pressing Blu-Spec CD2 (BSCD2) CD in Mini LP Sleeve (US Cover - heavy-duty GateFold). BSCD2 First Pressing Sticker. Mini LP Sleeve with Blu-Spec CD2 (BSCD2) CD. Cardboard Sleeve (Mini LP Sleeve) reissue from Jimi HENDRIX and The Jimi HENDRIX Experience.